Xin chao! Welcome to Ho Chi Minh City, Vietnam. Meet your tour guide on arrival at Tan Son Nhat International Airport. Transfer to the hotel in city center and check-in. Hotel rooms may not be ready until 14:00 but an early check-in would be guaranteed with a surcharge. The rest of the day is at leisure. Subject to your arrival time, you may want to venture out to explore the city on your own or join one of our wonderful optional excursions in and around Ho Chi Minh City. Start your day with morning hotel pickup and transfer to your luxury speedboat at Ho Chi Minh Pier. From there, travel comfortably in a high-quality speedboat to Vietnam’s famed Cu Chi Tunnels. The river cruise takes approximately one hour and local fruit with unlimited refreshments are served on board. Observe life along the riverbanks as your guide informs you about the local people's river-based livelihoods. Enjoy great photo ops of the Saigon River's jungle-fringed canals and tributaries, where you might see houses on stilts or water buffalo at work. Disembark at Cu Chi and follow your guide through the historic site, now a war memorial that features the impressive labyrinth of tunnels dug by Viet Cong guerrilla fighters during the Vietnam War (known in Vietnam as the American War). Tour sections of the 75-mile-long (121-km) complex, which proved key to military campaigns such as the Tet Offensive of 1968. You can even slip into one of the narrow passageways to imagine how the supply routes and communications, hospitals, and food and weapons caches were operated underground. After experiencing the tunnels, enjoy lunching on traditional Vietnamese fare at a riverside restaurant. Return to Ho Chi Minh City in a climate-controlled minivan, passing through the countryside to get a taste of rural life. Stop at a cricket farm and discover a Vietnamese delicacy as you watch crickets being prepared as food. Then taste the fresh herbs that go into many Vietnamese dishes at a nearby organic herb farm. Top off your experience by visiting a home where rice paper is made the traditional way, shaped by hand then cooked over a fire and dried in the sun. Your tour ends with drop-off at your Ho Chi Minh City hotel in the late afternoon. 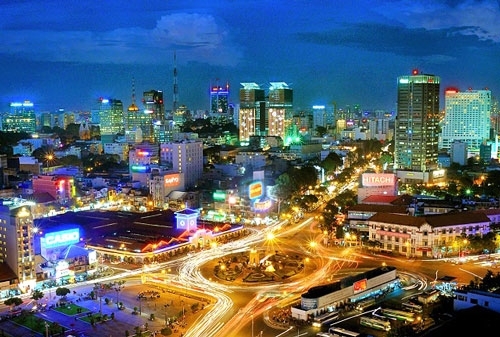 Travel back to Ho Chi Minh City (about three hours) and do 4,5 hours tour for you to enjoy a wonderful evening in Saigon. 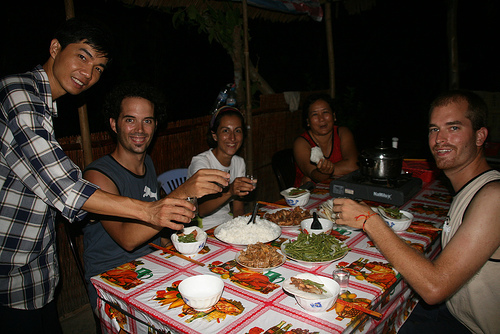 You will travel to non-tourist destinations and see the real life of local people. This four hours food tour on the back of our own scooters will take you through districts 1, 2, 3, 4, and 10 where you will see the local’s activities in the night time. And guess what, we're gonna sample 10-15 different dishes during this food challenge. At 5:30 PM, your personal English speaking tour guide will be waiting at your hotel lobby to meet and greet. We will do a quick instruction on how to drive safely and what you need to do in the back of our scooters. And hang on tight, let's the journey begin!!! We will go with the flow of traffic during the rush hour but we guarantee it's not a big problem since we are good drivers. After 20 - 25 minutes, we will be completely outside of those tourist destinations and be at real local vendors, where you have a chance to try Vietnamese noodles, pancakes while learning about the history and also special significant of each dish. At this point, you will probably be quite full, so let's take a short sightseeing, zip around the city, feel the cool of the weather, take a look at our amazing nightlife and slowly fall in love with Ho Chi Minh city. Feel relax yet? Here comes the traditional Street BBQ in Vietnamese style. What can be more authentic with a mini oven on the table and grill different types of meat and eat it instantly? Ooh, did i mention about local frozen beer, it's a perfect place to have a drink for sure. Are you full now, cause we still got our last stop for the dessert. Let's try some Vietnamese sweet desserts that will leave a great taste and impression about our cuisine. After closing the tour, we will drive you back to your hotel around 10:00 PM, wish you all the best and hopefully we have a chance to see you again.